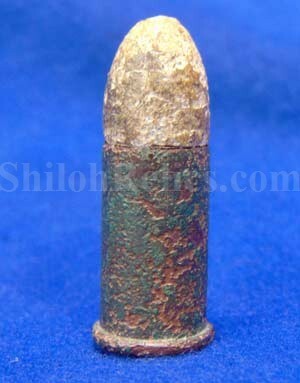 This is an excavated authentic metallic cartridge for the .44 caliber Henry Repeating rifle. 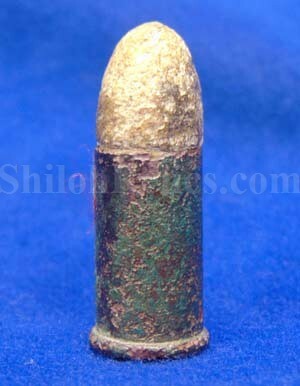 This is the pattern cartridge listed as figure #161 in McKee & Mason’s bullet book under the cartridge section. You don’t often see these in this nice condition when they are excavated. This one has been put back together and displays well as you can see. You can tell he tried to fire it by the strike mark on the bottom of the cartridge. This piece was recovered in the area of Fredericksburg, Virginia. 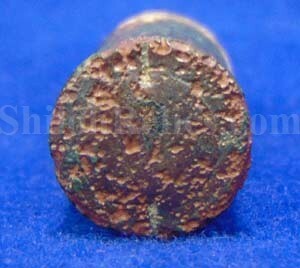 The price quoted is for the exact excavated Henry rifle cartridge you see pictured. It is an excellent excavated piece of Civil War history!